$5.32 $3.98 You save: 1.34 ! 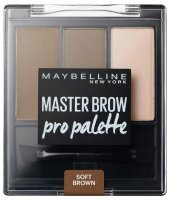 BROW SATIN by MAYBELLINE. Crayon designed for eyebrow styling. Two tips allow for perfect modeling of hair. One is an automatic liner, perfect for marking lines. The other one is a sponge powder for filling in any gaps. Thanks to this solution, it is easy to get a clear look that will draw attention and the make-up will be perfectly finished. The product is available in three shades. Great! The puff side gives a natural filling, though it gets dry after few seconds but refiles after closing it.